Do you find that your home often feels too cold? Are you constantly playing with the thermostat in order to find a more comfortable temperature? If you answered yes to any of these questions your home may be poorly or improperly insulated. Proper insulation is the key to making your home as energy efficient as possible. Since a well insulated home does not lose heat as quickly as a poorly insulated one, it is much easier to keep your home at a comfortable climate without constantly raising the thermostat. Plus, a properly insulated home uses less fuel, which is better for the environment and saves you money. At Weatherize Alaska, we understand the many merits of having a properly insulated home. That’s why we’ve devoted ourselves to installing the highest quality insulation for your home, saving energy, money and adding years to your home’s heating system. We’ll come to your home and assess where new or better insulation is needed most. 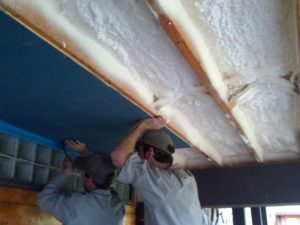 Then our skilled group of installers will make sure that your new insulation is placed in your home correctly, to insure that you maximize heat and energy. Weatherize Alaska is fully licensed and insured and prepared to tackle most any job. From minor additions to full-scale installation replacement Weatherize Alaska handles it all. Start saving money and energy with new insulation. Call Weatherize Alaska today!